This seems potentially excellent . Lol if you discover oblivitron with this. Can it play itself from Hand? It would be Trolden video-worthy since oblivitron needs to die first to be able to discover it and then somehow be in your hand as well. Absolutely worth it in hunter. A Spider Bomb died, you play this. You get a Deadly Shot and another Spider Bomb in your hand. Still havent seen any new deathrattles that are worth it, but this is already good with what we got. Wow this card can be nuts! obvious powerfull deathrattle cards like: Savannah Highmane, Mechanical Whelp, maybe Deranged Doctor for extra heal? Cairne Bloodhoof is still a thing. oblivitron looks tiny bit better. 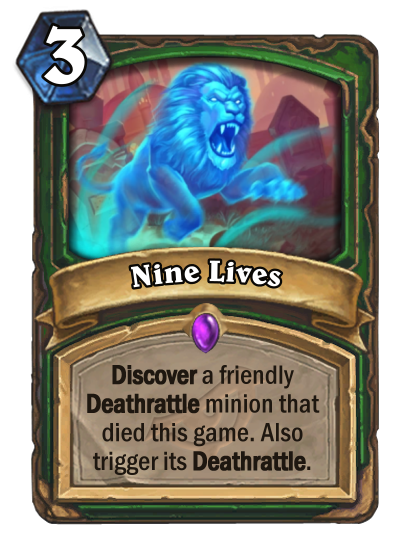 It works with Zul'jin and you can combo it with Necromechanic for an extremely strong 8 mana play. This makes me think so much about Necromechanic. If you can play her and play this card, you can get their Deathrattle twice (which I hope that interaction does work) and that's done before your opponent can take care of the Necromechanic. As for wild, there are much more powerful (and/or broken) interactions with card. Great concept and I am glad this card is coming in after rotation. Nice. The only problem is Hunter's inconsistency with complicated stuff in future Standard. Dane is certainly going to use it in his Reno Hunter deck. I can think of some good targets - Sylvanas, Sneeds'. Oblivitron gets some support, but I'm eager to see the big deathrattle mech, which would win hunters the game. Nice card in a value deck. There is no strong 1/2 mana deathrattle minions you want to trigger with this one. The only decent early minion is Spider Bomb, which will make it like a Deadly Shot with a card draw, which is very good. Of course it can trigger heavier deathrattle from heavier minions, but that comes much later in the game and you don't want for this card to be a dead card for numerous turns, if it's in your hand on turn 3, you want to play it and get value out of it, and that's the problem, there is no good 1/2 mana deathrattles you want to trigger it with. So this card is quite slow and inconsistent atm, maybe that will change with introduction of new cards. 5 mana summon Mechatun kill it with hunters mark and arcane shot. Not too bad.